The good news: T-Mobile is playing with the idea of letting you unlock your phone (so that it can run on other carriers) with a single click. Hurray! No more convincing customer service to help you, or digging through endless forums for a tutorial that may turn your phone into a fancy paper weight. The not-so-good news: they’re only testing it on a kind-of-meh Samsung phone for now — and even there, there are some catches. The biggest catch is a fair one: to unlock your phone permanently, it has to be completely paid off. So, no, you can’t pop into a T-Mobile store, get the phone at a discount on an installment plan, then unlock it, cancel your plan, and ride off into the sunset. You also need to have been with T-Mobile for at least 40 days, and your account must be in good standing. But what if you only need the phone to be unlocked for a while, like when you’re traveling? 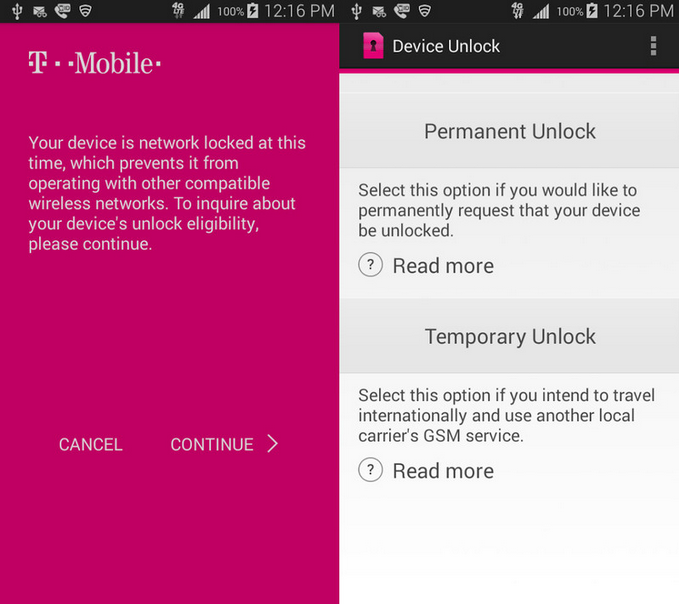 Though it seems like T-Mobile is still working out exactly what the guidelines for a temporary unlock are, a second button within the app allows you to unlock the phone for up to 30 days without quite as many rules. Our buddies over at Android Central checked what happened when they stuffed the app into other Android phones, and it’s about what you’d expect: the app itself boots up just fine, but the unlock buttons are worthless.